Cindy & Chris | Love It or List It Galleries | Merit Kitchens Ltd. The tiny u-shaped kitchen was located at the back of the house with the dining room situated at the other end of the home. 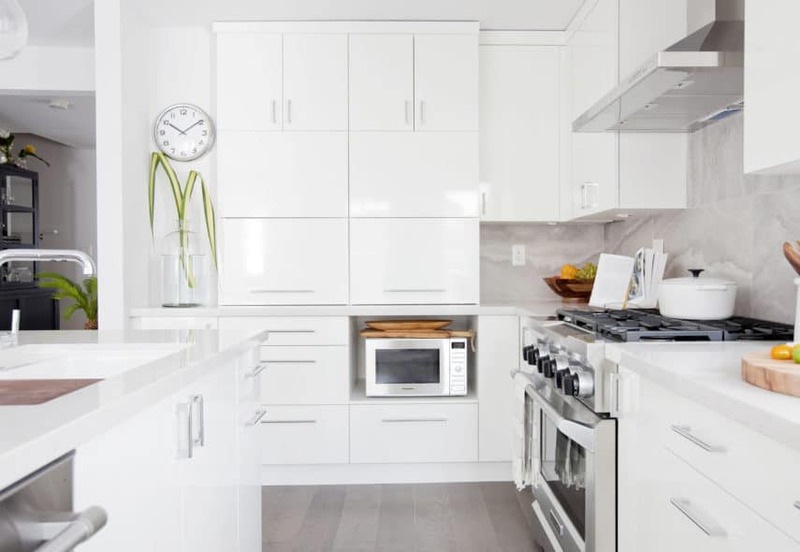 The Love it or List it Vancouver design team called upon Merit Kitchens to help the homeowners. The result is a modern, chef-worthy kitchen large enough to have the whole extended family cook together. With a generous island and seating space for small gatherings, this kitchen satisfies any host and hostess’s dreams. Another important consideration in the kitchen design was moving all small appliances off the countertops. Double ‘appliance garages’ met this need well, and were finished with stylish chrome cabinet pulls. Additional Features: The wall cabinets extend down to counter-level to maximize kitchen storage. They also feature specialty bi-fold, lift-up hardware for easy access to the cabinet interior. The microwave is tucked neatly under the countertop and the contemporary, square crown molding extends to the ceiling.